Update: Just over six months after Bethesda said it would pursue legal action against the developer of the Westworld mobile game, Bethesda announced in a press release that the two parties have "amicably resolved" their dispute. It's rare to hear details about out-of-court settlements (they often include clauses forbidding either party to publicly discuss them), but the Westworld game remains available for download on iOS and Android. Original story: Westworld fans who downloaded the freshly-launched mobile game may have been surprised at how closely it resembles 2015's Fallout Shelter. Bethesda certainly was, and it's none too pleased with Warner Bros. and Shelter co-developer Behaviour Interactive. 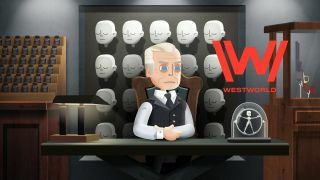 The company has filed a lawsuit seeking compensation for damages and demanding that the Westworld mobile game (at least in its current state) be pulled from app stores. "The Westworld game is a blatant rip-off of Fallout Shelter," reads the lawsuit. "Working with the same copyrighted computer code used by Fallout Shelter, Westworld has the same or highly similar game design, art style, animations, features and other gameplay elements as Fallout Shelter, all of which are owned by Bethesda." So what does that mean in non-legal jargon? Fallout Shelter and the code which runs it is indeed owned by Bethesda, but was developed by Behaviour Interactive, an independent studio. The lawsuit alleges that Behaviour took the code it developed for Fallout Shelter (which would belong to Bethesda) to Warner Bros. in order to create the Westworld mobile game. Bethesda's list of evidence is long, but one in particular stands out and could be seen arguably as a smoking gun: bugs. Or rather, a very specific bug. Bethesda argues that while in the Westworld game's demonstration mode, "the view is out-of-focus and the scene that appears is far to the right and below the targeted landscape image. It is as if a camera capturing the scene had been inadvertently pointed to the lower right foreground and then slowly refocuses on the central image." Bethesda says it knows this to be evidence of Behaviour using Fallout Shelter code because... the identical problem appeared in internal versions of Fallout Shelter but was fixed before that game was released to the public. Hey, Bethesda knows its bugs.